To measure receiver noise figure, normally you need a calibrated RF noise source. I had been using a cable-TV amplifier with known noise figure and gain. With the input terminated, the output noise level above thermal is the sum of the two values, which was simple enough. But I wasn't sure the level was stable so I decided to build a dedicated noise source. 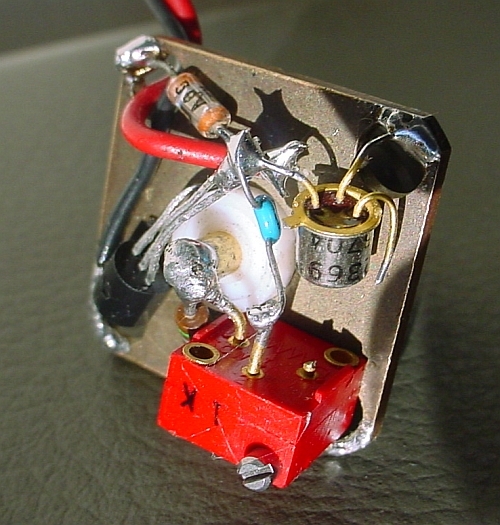 The circuit reverse-biases a 2N2369 base-emitter junction to generate avalanche noise. Because the noise level varies somewhat with junction current, instead of a load resistor I used a 2N5484 JFET arranged as a constant-current source. The current is equal to IDSS, 3.9 mA for the 2N5484 I selected. 2N2369 VEB is 5.9 V. It remains constant for any supply voltage above 7.2 V. Output impedance is 50Ω. For 75Ω, change the 56Ω resistor to 82Ω. I built the source on a female N-connector to directly mate with a variable RF attenuator, which wasn't needed for the Y-factor method I finally decided to use. A trimpot adjusts the output level. Originally I had intended to set it for a round ENR value, but I discovered that a setting of 322Ω yielded the same return loss with the power on or off. This makes it unnecessary to substitute a 50Ω load for the source during noise figure tests. I measured a return loss of 29 dB with a power splitter that yields 30 dB for a 50Ω load. To calculate ENR I measured the output noise level with my HP 141T/8553B/8552B spectrum analyzer preceded by an HP 461A amplifier. I had measured the noise figure of this system as 12.3 dB. Noise increased 2.76 dB with the noise source on, for an ENR of 11.8 dB. This becomes 8.4 dB at the receiver antenna terminals after including the losses of the power splitter and matching network needed to measure noise figure. This noise level yielded Y-factor values in the 3–6 dB range for a variety of FM tuners.